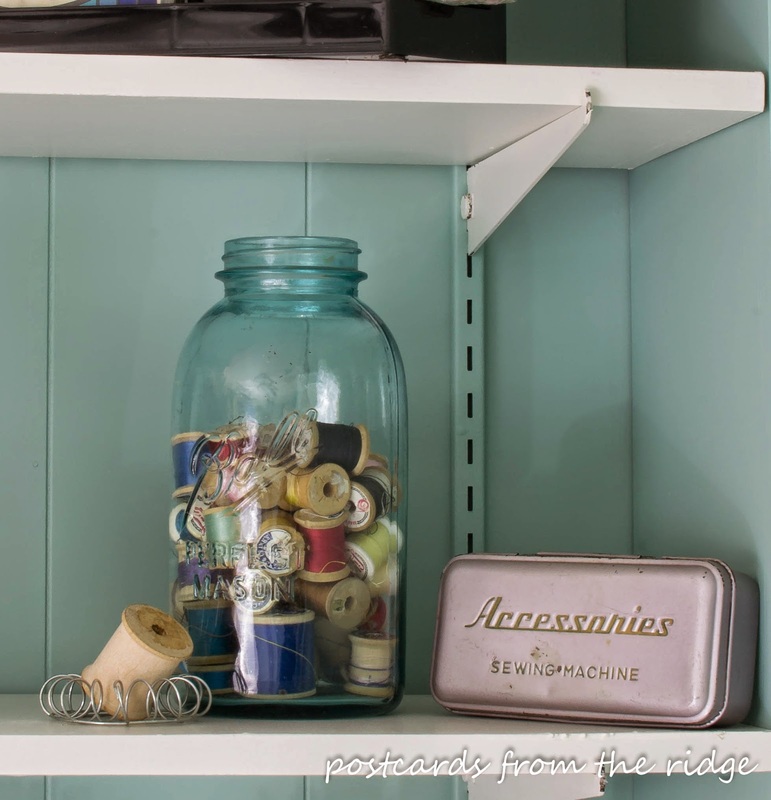 Using vintage and thrifted items for organizing your home and office. 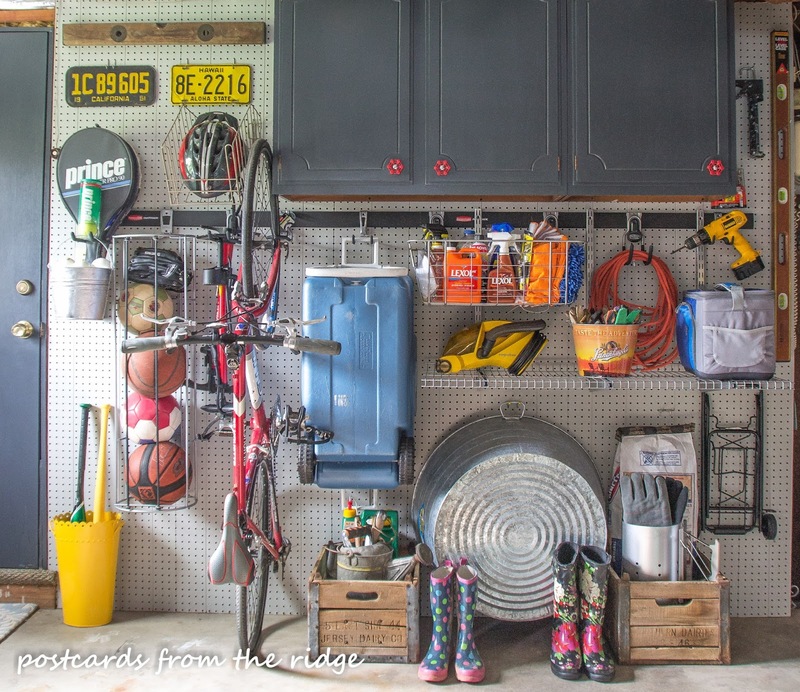 Need to get more organized? So do I. I've been on a huge mission at our house lately. It involves being honest with myself about what I use and love and then getting rid of everything else. 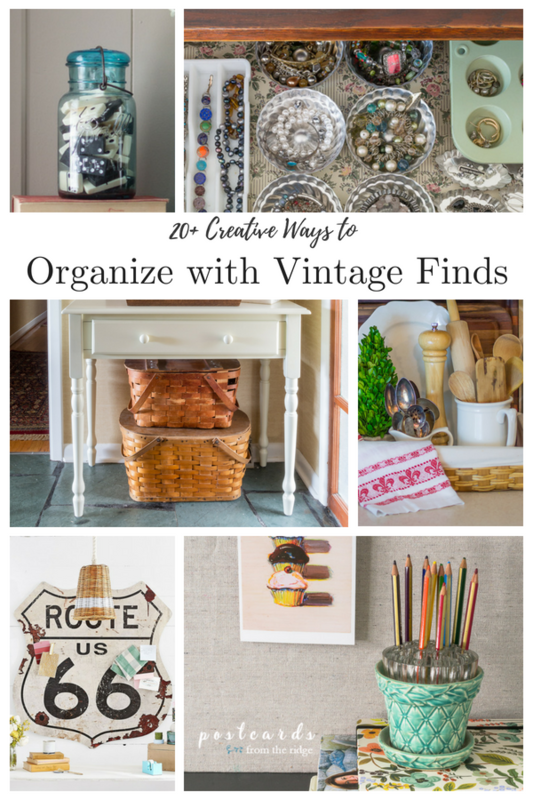 And for someone who has been collecting vintage items for almost 30 years, it's a really big job. But I'm so glad I'm doing it! Every time I get rid of something that I'm not using (no matter how "useful" it is), it's like a burden is lifted from my shoulders. The things that I'm keeping are loved and utilized. It thrills me to be able to actually use some of my collection for unique storage and organization. I'm sharing how I've used my finds, and hopefully you can use many of these ideas in your own home. Let me know which idea is your favorite! 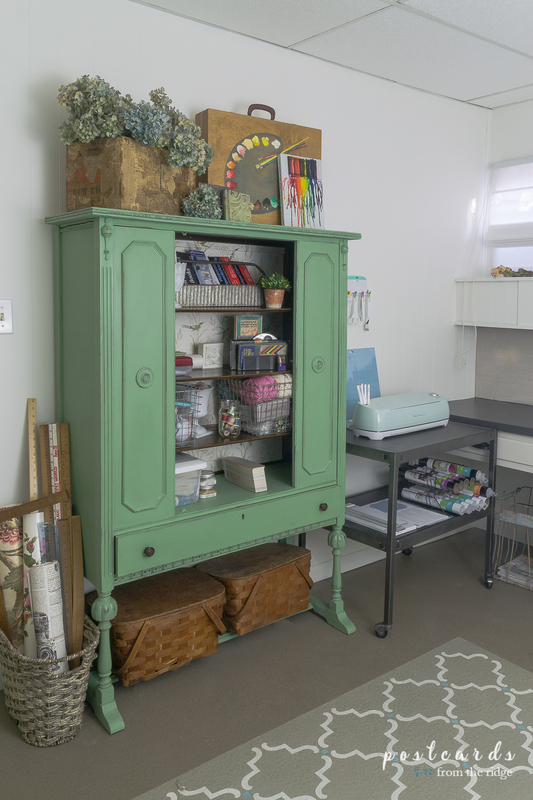 When I gave my studio a makeover a few months ago I used this antique China hutch to store many of my art supplies. 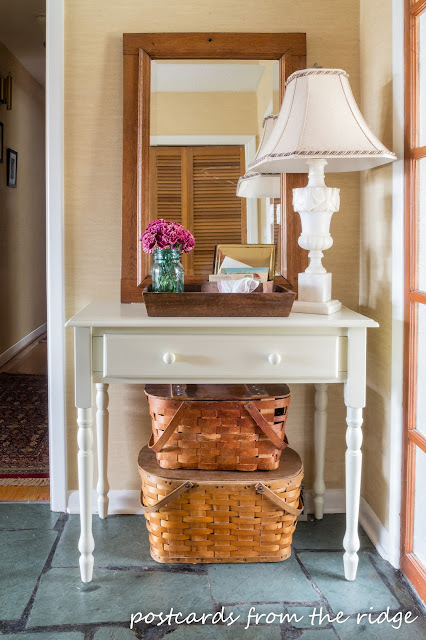 It got a fresh coat of paint and was lined with wallpaper and is now the perfect accent piece in the room. You can find pieces like this at thrift stores and estate sales for various prices. Painting them gives them a brand new vibe and doesn't take much money or time. 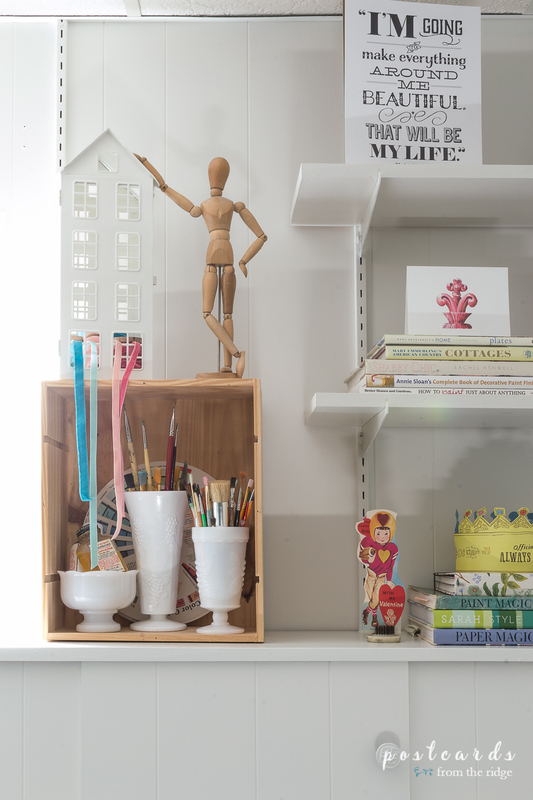 You can see the rest of the studio makeover HERE. 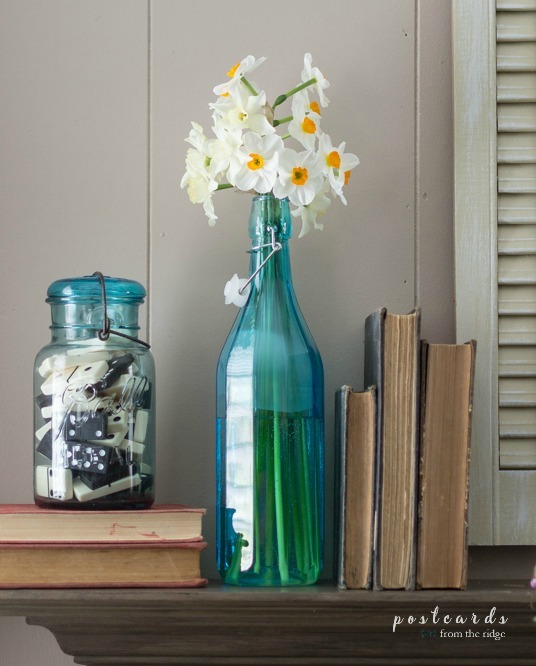 Milk glass vases and compotes are so versatile and usually pretty easy to find. 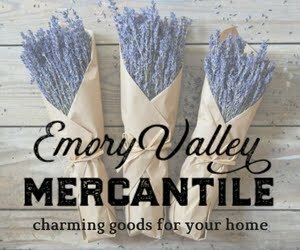 (Check ETSY, thrift shops, yard sales, and estate sales). 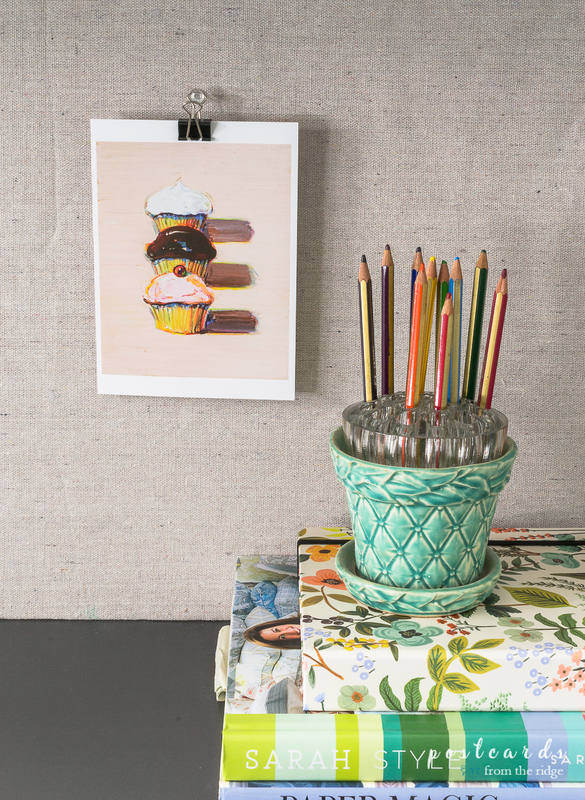 They're perfect for brushes, pencils, and so many other things. Want a fun way to store pens & pencils? Add a glass flower frog to a small flower pot and you're set! 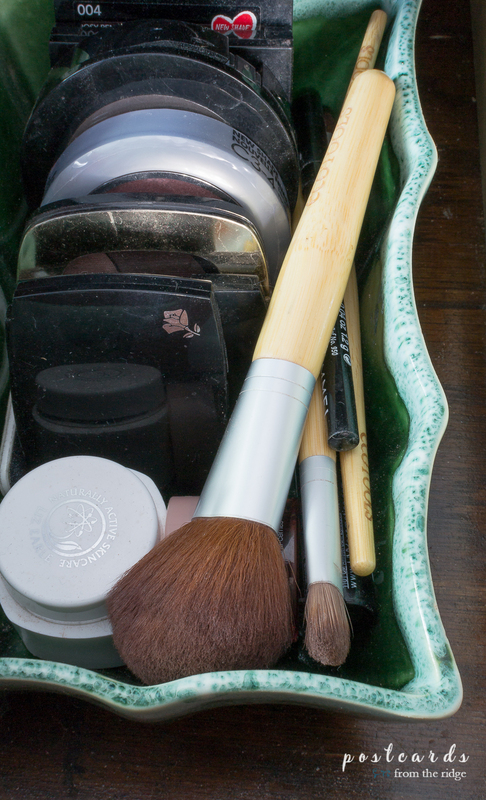 A shallow planter in the bathroom or vanity drawer is ideal for makeup and brushes. A vintage metal crate is a great way to store and show off your favorite throw blankets. 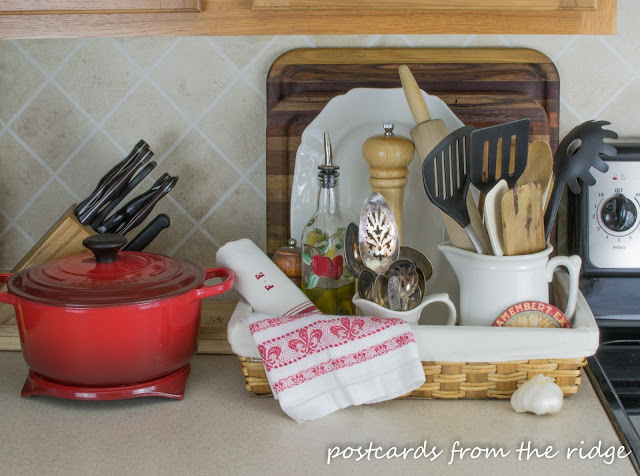 Pretty little dishes and bowls are the perfect way to corral pens, pencils, and all those loose things that roll around in drawers. 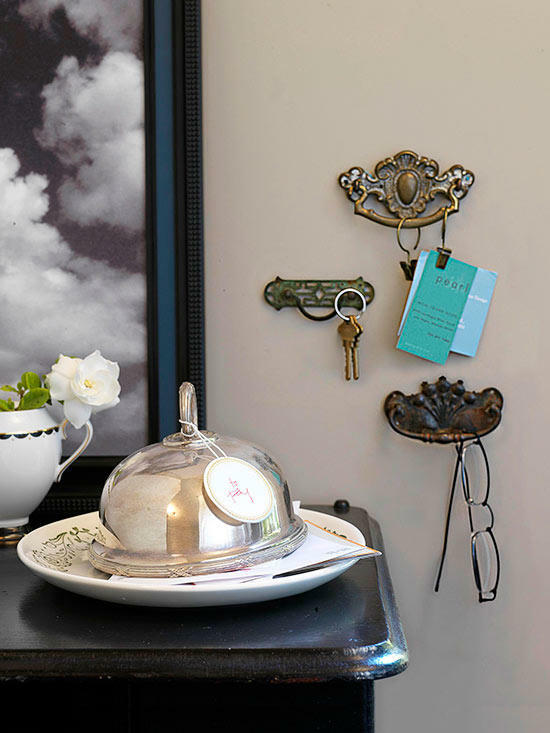 These vintage silver dishes are great organizers in one of our kitchen drawers. They make it look so nice! 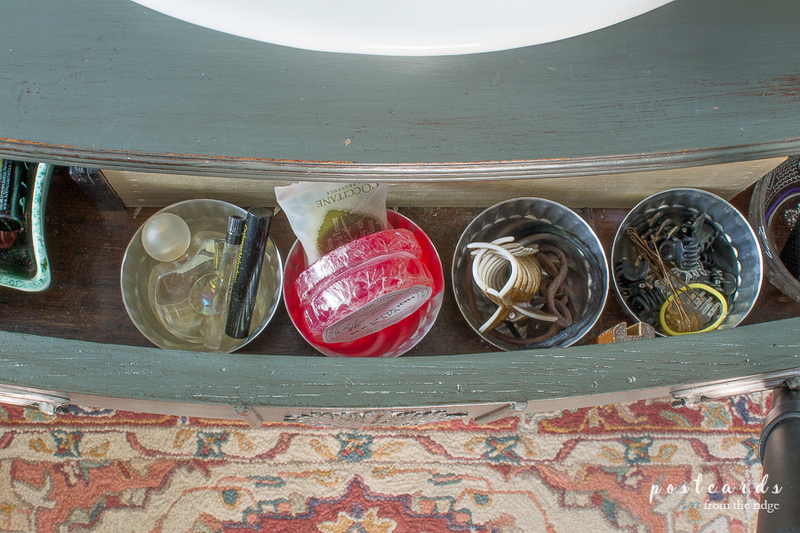 These little jello molds are a fun way to organize jewelry and also little items in our bathroom vanity. 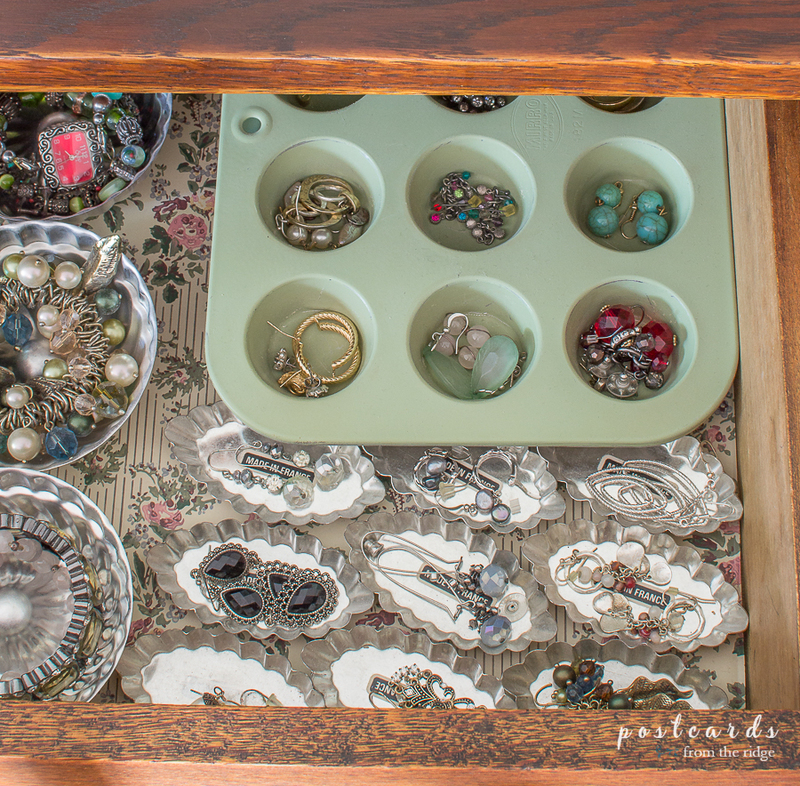 Muffin pans and tart tins are also perfect for small jewelry. 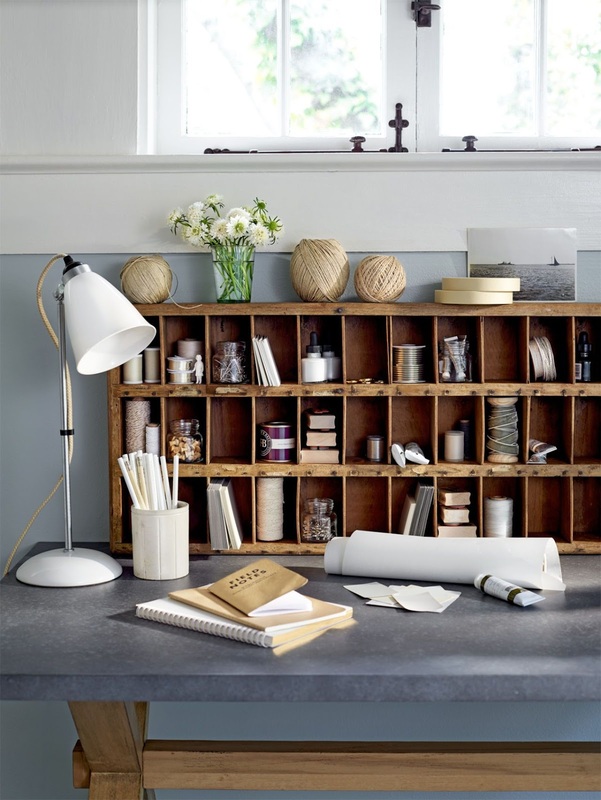 They would also be great storage for small office supplies and craft supplies. 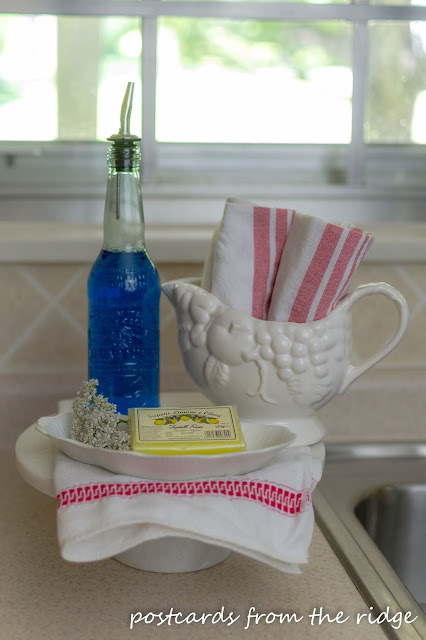 These vintage milk glass dental trays would be useful for so many different items. I'm using them for some of my bracelets but they would be great for office supplies too. 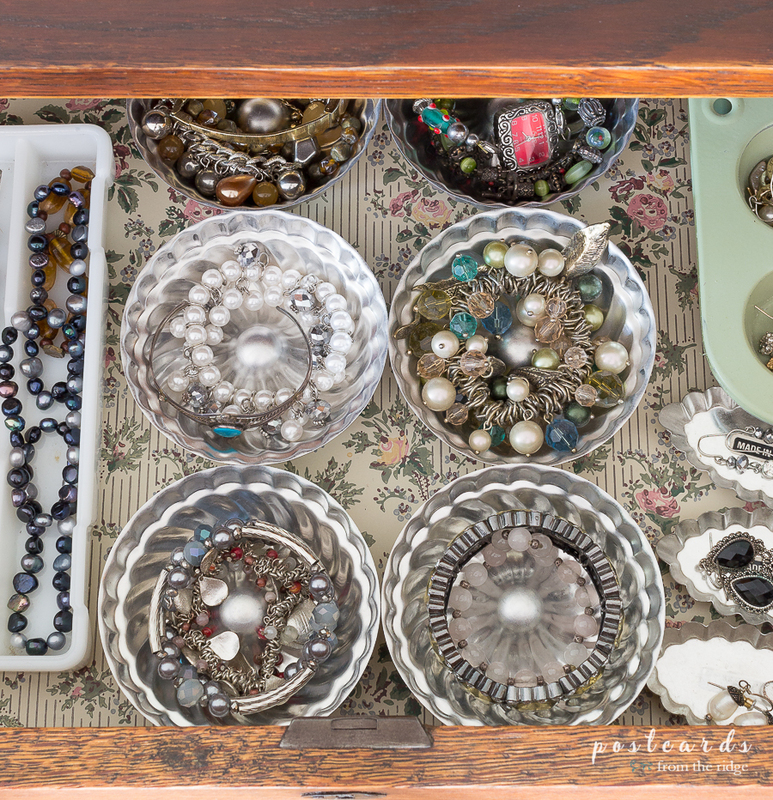 Vintage punch cups and tea cups are great ways to organize small items. 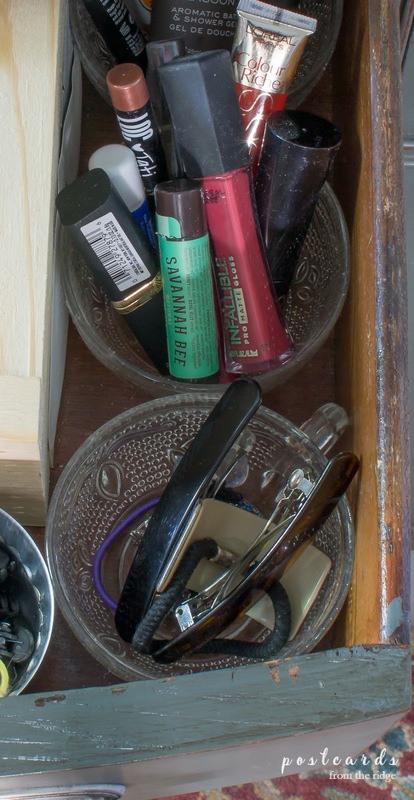 I've got hair items and makeup in these that are in our bathroom vanity drawer. Rolling carts are so versatile. They can be used as beverage carts, storage carts, and more. 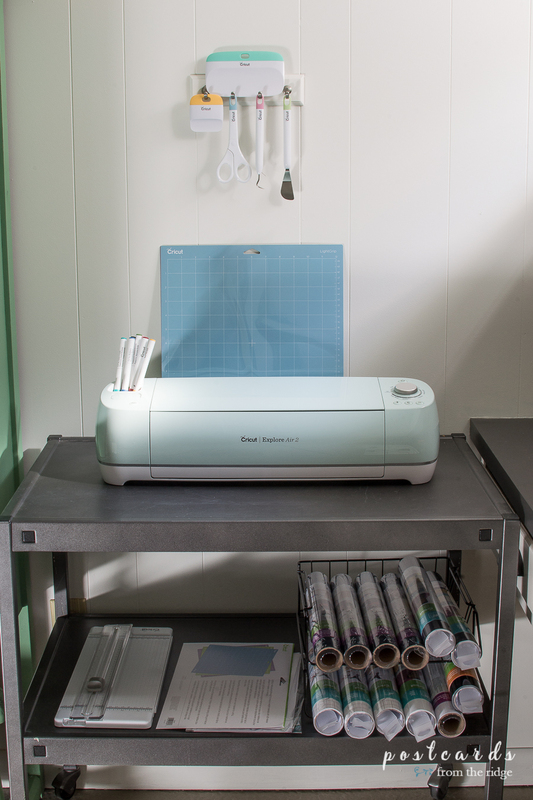 This vintage printer cart got a facelift and now has my Cricut machine and supplies stored on it. 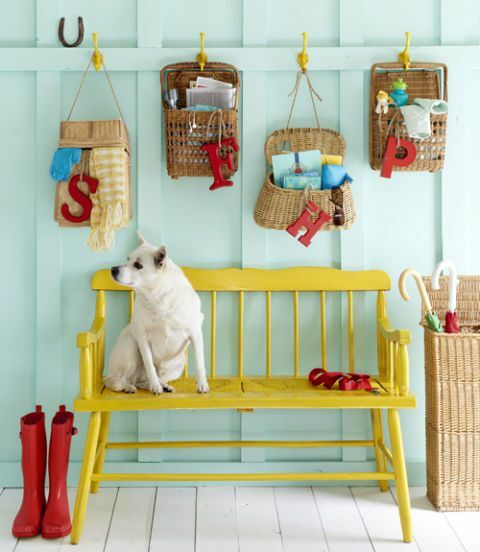 Perfect for hiding and storing so many things, vintage picnic baskets are usually inexpensive and easy to find. 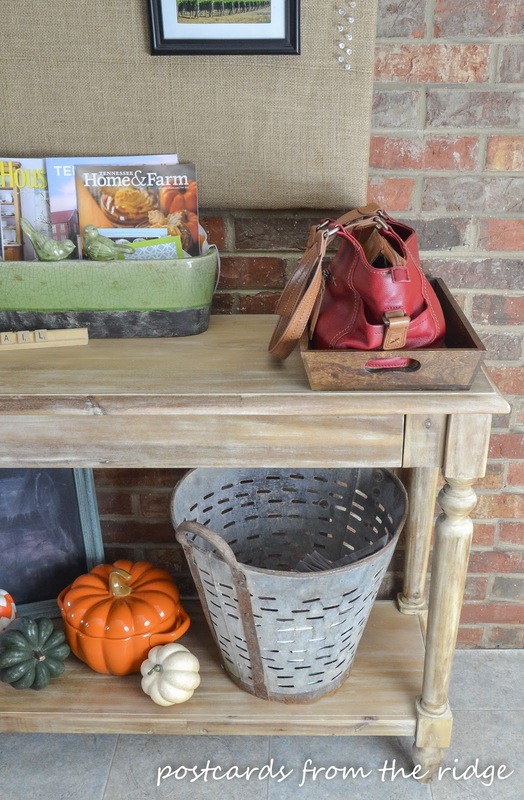 I love my vintage olive basket and have used it so many different ways. 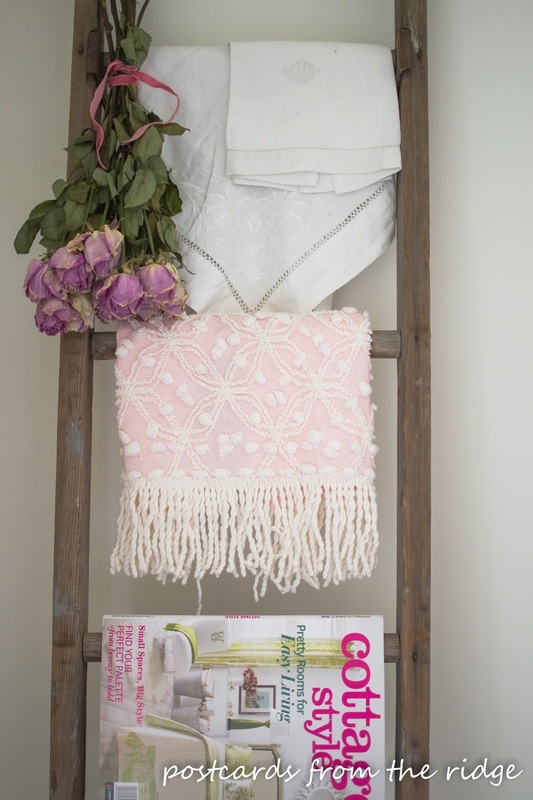 It's perfect for tossing items to be recycled, holding throw blankets, kindling, and even plants. To see even more ways to use them go HERE. 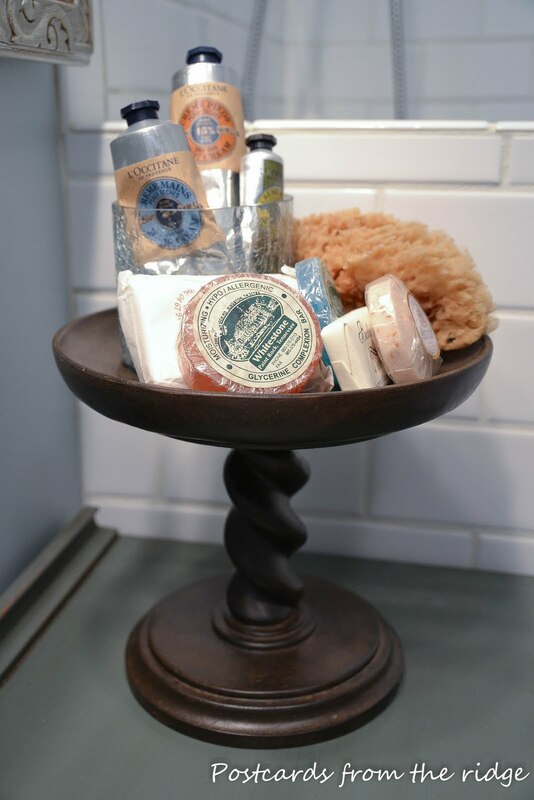 You could use an ironstone pitcher as a utensil holder in the kitchen, but they also make great vases. 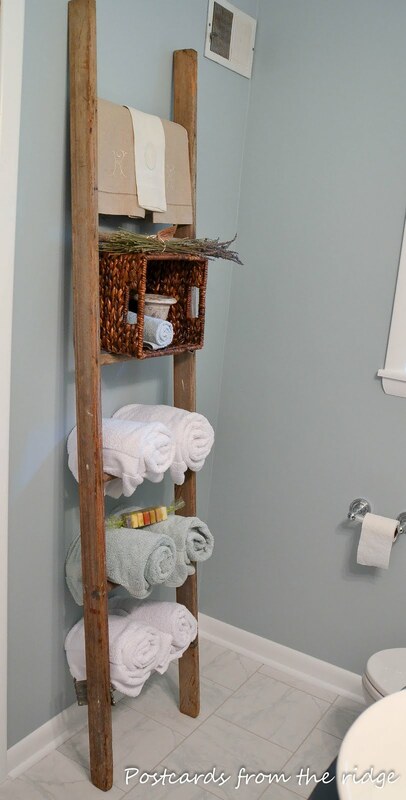 We use an old wooden ladder to hang towels in our master bathroom and another one in the living room for throw blankets and magazines. 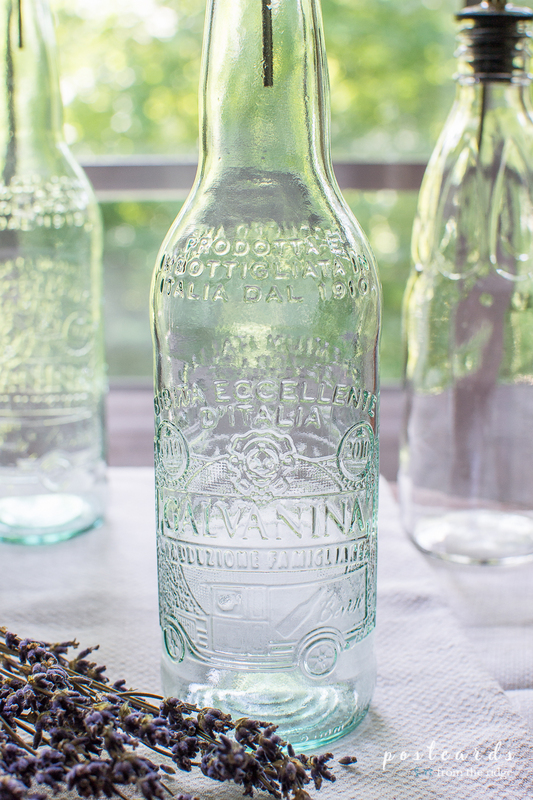 Use vintage mason jars to store your vintage dominos, or anything else small. 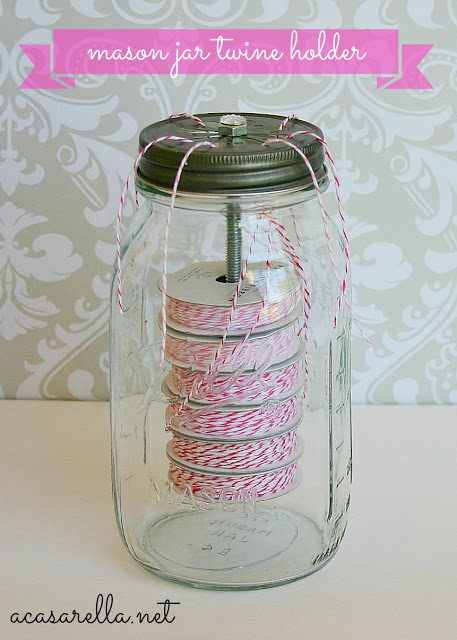 They make great storage for old wooden spools of thread too! Old wooden milk crates store some of our grilling and garden items in the garage. 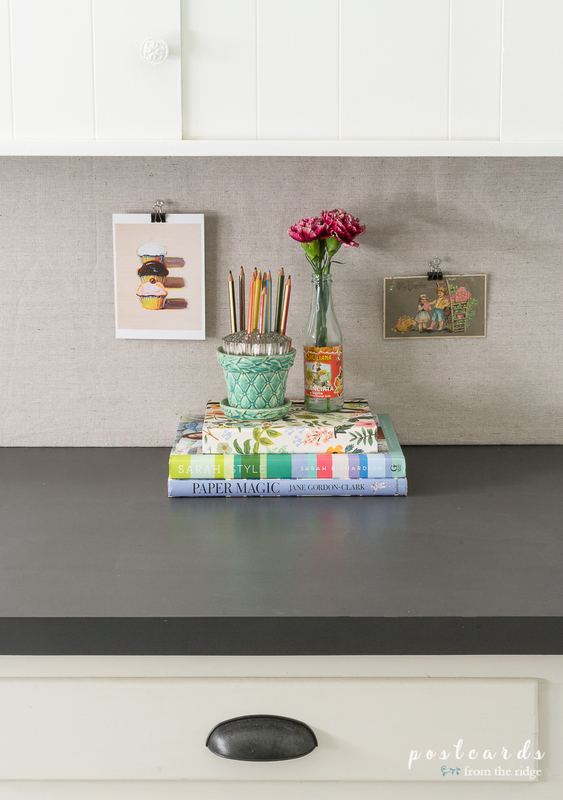 Cake pedestals are a nice way to get things up off your counters. 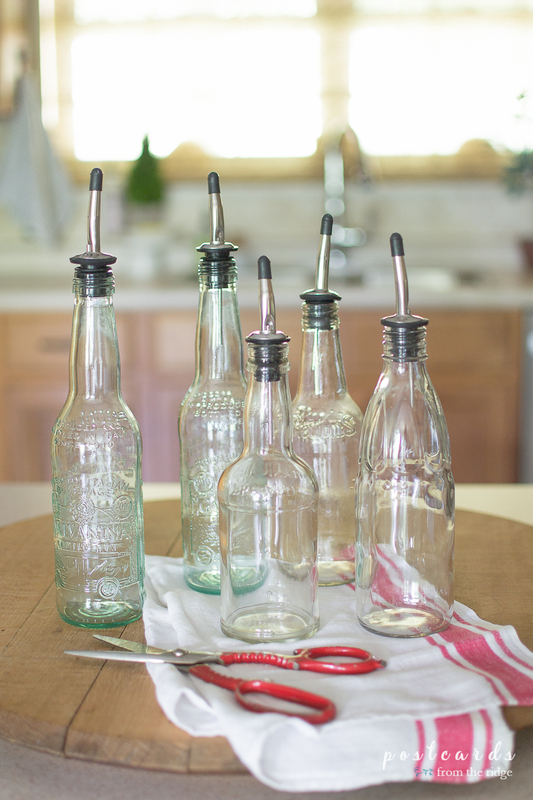 I used one in the kitchen next to the sink for dish soap and miscellaneous items. 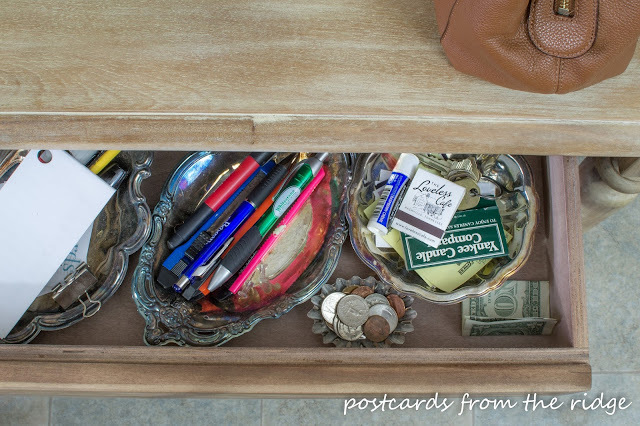 Need a place to stash pens and pencils on a shelf, desk, or table? A vintage trophy is a gorgeous place for them. 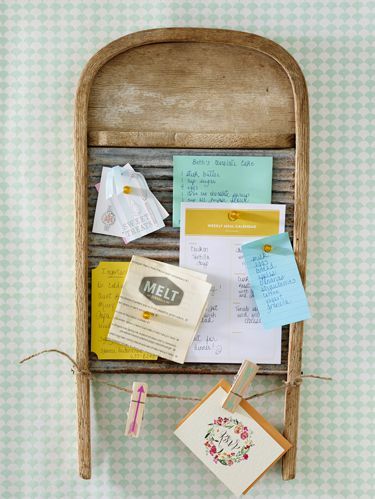 Also notice the little bowls with paper clips and binder clips, and the folders are stored in a plate stand. Think outside of the box!! These swivel hooks are a great way to hang scarves in our entry closet. You could also hang aprons, purses, belts, and more on these. 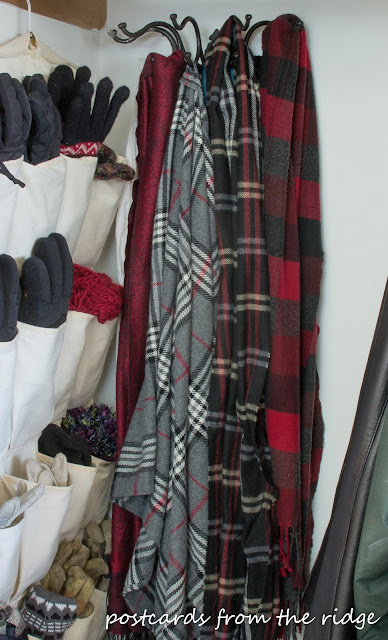 Did you notice the pocket shoe organizer we use for our winter gloves and hats? Again, think outside the box! Need more ideas for organizing with vintage items? 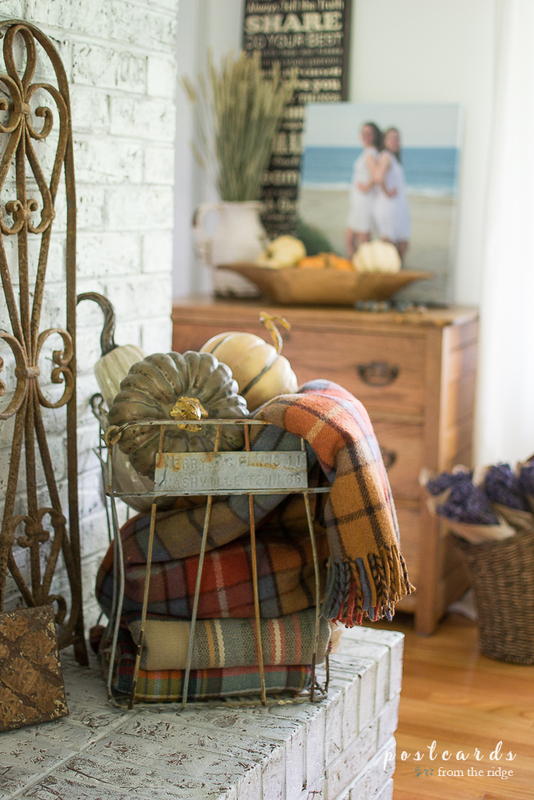 Here are some of my favorites from Country Living. 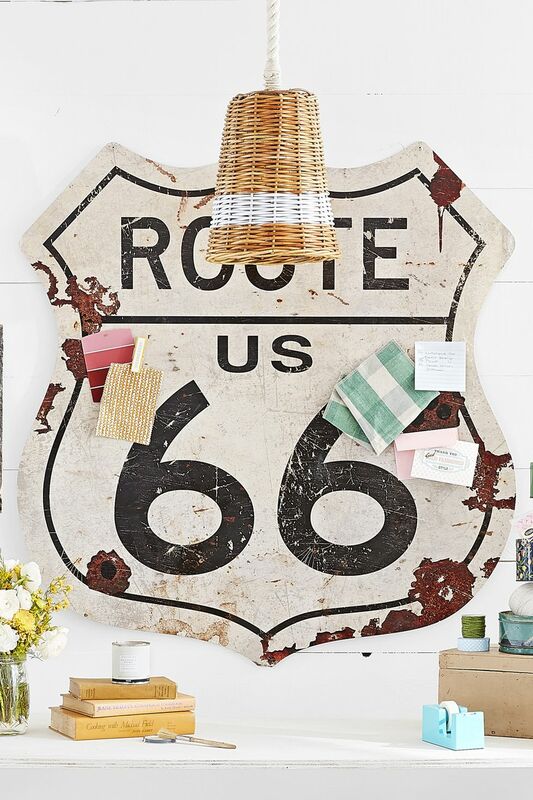 Authentic vintage route 66 sign found HERE. Reproduction versions found HERE and HERE. thrift shops - cross your fingers!! 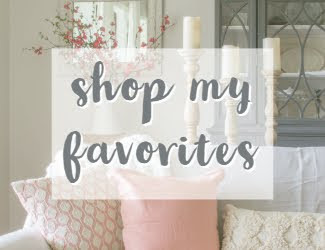 See some of my favorite vintage organizing items from etsy HERE. 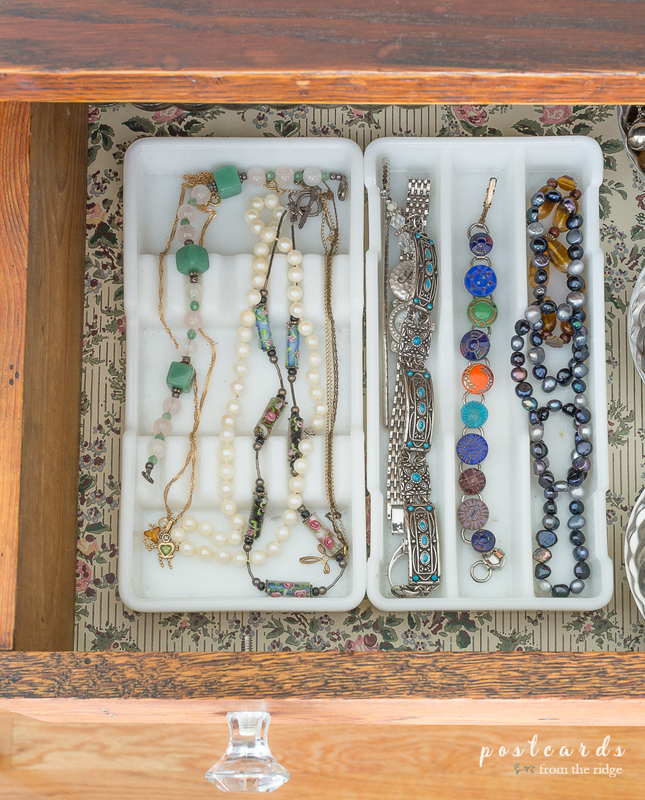 What are some of your favorite ways to organize with vintage goodies? Leave me a comment and let me know. I'm always looking for good ideas! 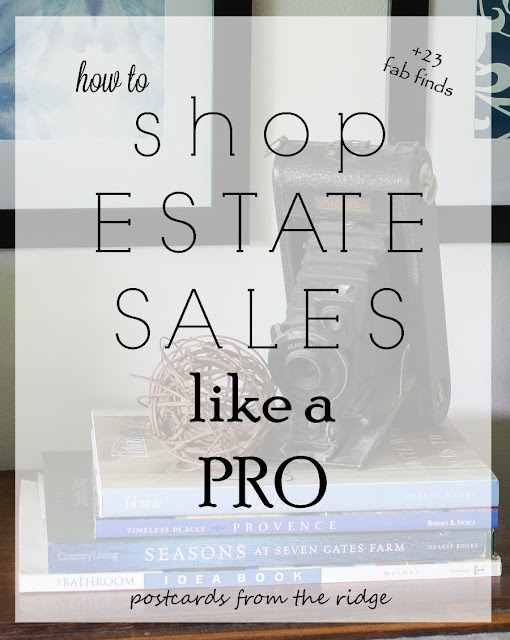 Want my best estate sale shopping tips? Go HERE to learn my secrets. Thanks so much for dropping by. Happy organizing!! I love this post, outstanding! Great ideas, Angie! 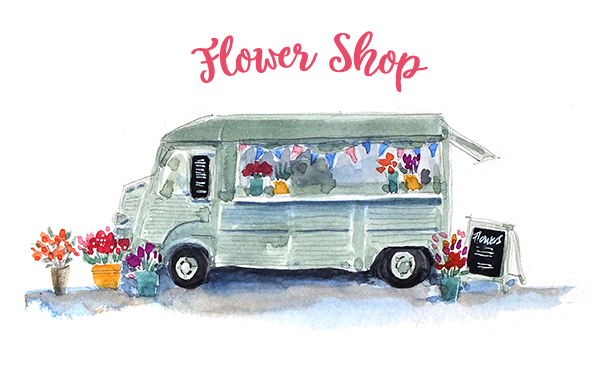 I really liked the glass flower frog in the vintage planter; totally going to do that! 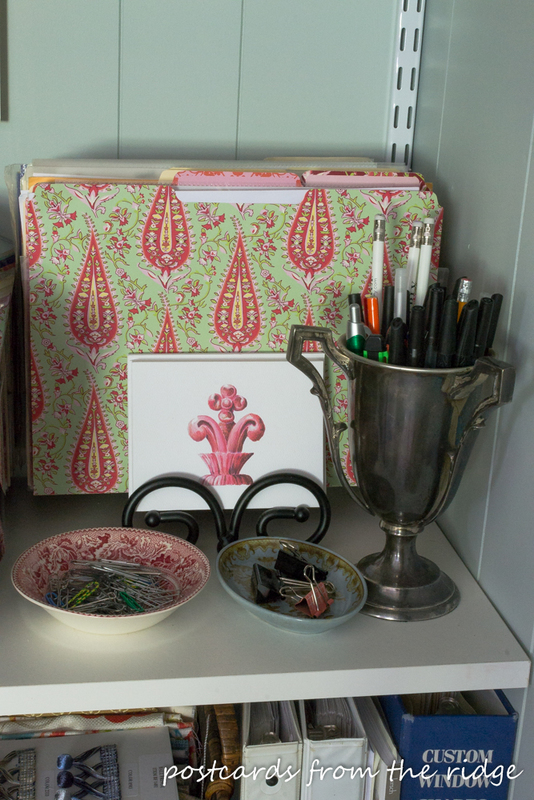 But the greatest idea I got was one you weren't even mentioning...your vintage wallpaper as drawer liner! I've got an old stash I've been trying to decide how to enjoy-totally going to put it in my newly redone green dresser!